The Road Home; The Majestic Diner on Ponce de Leon in Atlanta; 40 Year Reunion; Existentialism, Eggs and Grits. On my way back to Rome, Georgia Big Red, my 2004 Harley Road King and I decided to stop at Griffin. I had earned enough frequent visitor points from a hotel chain that I got a free room at the motel. Then I had a Mexican takeaway and watched TV for a change. The Dirty Harry movies were on. Next morning I headed to Atlanta to meet my two old buddies Jeff and Kevin for breakfast at a place we used to haunt years ago: the Majestic Diner. This was when all three of us worked at Peachtree Psychiatric Hospital. Sometimes we worked a 3-11pm shift and it was the only restaurant open. I figured that it had been forty years since the three of us had sat together in one of the booths. Back then we had talked about women (problems with or lack of) and what we wanted to do with our lives. Now, forty years later we were talking about women (problems with or lack of) and what we wanted to do with our lives. The difference was that we had forty years of existence since we had first discussed philosophy over eggs and grits. I’m not sure that any of us felt like we had learned very much. We got to talking about existentialist philosophy, Kierkegaard, Nietzsche, Sartre and Marcel. Our memories were rusty, which was okay because existentialism had grown pretty rusty too. Regardless of the roads we had ridden on over the years the young, naive, arrogance and hubris of our twenties had been battered, scarred and smelted into a more pure vulnerability and humility, which was a good, albeit painful, thing. After two hours it was time to hit our different roads and talk about when we might get together again. Maybe at Huck’s Cove right on the bayou in Gautier, Mississippi where we had ridden to once before? Who knows? We’re more patient now. And more trusting. Next Two Chapters, Seven and Eight, of My Motorcycle Novel – Hope Bats Last; Relax with a nice cross-country murder mystery! Check out the previous chapters! Here’s a message for the faithful. What is it that you cherish? To find the Way to see your nature? Your nature is naturally so. What Heaven bestows is perfect. All you get is stupid. I slept for about an hour and woke up hot and sweaty. Checked my phone and saw it was 6:10 pm. Time to get something to eat. I made the short walk across the stream and up to the porch which was filled with bikers rocking, smoking, drinking and talking on their cell phones. I found Skunk. “Yep.” We walked into the restaurant, checked the menu that was scribbled in various colors onto the whiteboard and hemmed and hawed a bit. Finally, we gave our order to the waitress, some cute young high school girl wearing an expression of innocence, confidence and tender forbearance toward old men and their foibles. “Monk.” She wrote it down. We found a couple of seats back on the porch and reminisced how the place had changed over the years. He nodded and we rocked and overheard bits of chatter from the other bikers. Men were bent over, tipping this way and that with their phones, trying to check for satellite images of the weather. In the distance, I heard the clunk of a Harley going into first gear, turned and watched a guy ride off and then my eyes followed a couple in full leathers as they started climbing the stairs. She gave him a little slug on the arm, they laughed and wandered past us into the diner. “Monk!” Yelled a woman carrying a tray of food. I raised my hand and signaled toward a picnic bench. We followed her over to the table and sat down. “I remember her. Cute as a button. You gonna take Interstate 40? “Always thought those tank bags got in the way. Also, they spoil the look of Big Red.” I smiled. “I’ll be all right. It’s a big state. Even I can’t miss it.” I laughed. “Sounds good to me,” I said as I forked some coleslaw into my mouth. We finished eating and as the sun drifted down we just sat on the porch rocking and talking with other bikers. Biking is a fellowship and everyone coming up the stairs felt undefensive, eager to say hello, shoot the bull and talk bikes and trips. We sat there until it was bordering on dusk and a veil of coolness had descended upon the mountains and trees. The dinner bell rang last call for supper. I said goodnight to Skunk and wandered across the road to the waterfall. The reflection of the moon was flickering in the water. I heard a hoarse, cawing sound, looked up and spotted a murder of crows in the twilight. Though my short-term memory was pretty shot I somehow remembered an old Chinese poem from the time my buddy Joe and I were in China, wandering around in the mountains hiding from the law. Well, at least some of my long-term memory was still intact. I walked back across the road, across the bridge, over the stream and headed for my tent. About 50 yards ahead of me there was a gathering of folks near a blazing fire ring. I unzipped the outer cover of the tent and then heard a voice. “Hey, mister. Come on and join us”. It came from the fire ring. I couldn’t see who had said it but I saw faces smiling and a bottle being lifted in the flickering light. “Sure”, I replied and ambled over. There were seven other bikers, including a married couple around the fire ring. We introduced ourselves, said where we were from and where we were heading. Jokes and stories were told, favorite routes and campgrounds were shared and then one of the bikers, a veteran, launched into the soul-wrenching song: “I’m still in Saigon”. We were in awed silence as he finished, thinking of his war, our own little wars, the lost and still missing from our lives. Someone passed around a bottle of fireball whiskey and the jokes began flowing again. I felt happy as I stumbled back to the tent, guided only by the moonlight, the whiskey and my old Duck Dynasty flashlight. I climbed inside and got my stuff out so I could go and brush my teeth. Then I remembered: I’d forgotten to phone Colin. I fished out from my bag the structure sheets I had prepared for my phone calls. I had written down the questions and left space for my answers. I took out my pencil and jotted down the answers. “Where are you?” Answer and say something specific about the place. Suches, Two wheels campground. You remember that place. Ran into old Skunk and we had a good chat. Place has changed a lot. Flowerbeds are gone and so are the dead animals on the wall. Came up here once with Clare on the old BMW. Give the same answer always. Good, no problems. Bike’s holding up well. Not sure. Have to consult my map. Thinking about Highway 61, the great Mississippi River road. What? I forgot about my memory. Just joking. It’s good. I remembered all of a Chinese poem from when your uncle Joe and I were dressed as Buddhist monks in China, hiding out from the police. I finished up by asking about his work and about Siobhan and Stephen. The world about us is full of ghostly doings. Every moment of our lives is trying to tell us something, but we do not care to listen to this spirit voice. When we are alone and still we’re afraid that something will be whispered in our ears, and so we hate the stillness and anesthetize ourselves through sociability. The morning was fresh and crispy when I woke up. My neck and back were stiff but just needed a little stretching and would be all right. I unzipped the tent entrance and climbed out. There was the stream I had listened to all night. Mist was rising from the water and from the hillocks in the distance. The trees smelled new, fresh. Across the bridge, folks were already gathering on the deck, some smoking, some consulting maps. I wandered over to the bathroom and then came back to the tent. I leaned on Big Red and took in the beauty of the place. I remembered another Chinese poem. If useless things do not linger in your mind. A memory of my first wife Maeve brushed through my mind and I felt a flutter of longing in my gut. We were standing outside Dunluce Castle… Monk! I said to myself. Let go of the past. Stay in the present. I moved to an open area and started doing my Tai Chi movements. After about ten minutes I heard Skunk’s voice. I watched as he walked away. I packed up my gear and loaded it onto the bike. I cleaned the windshield and my helmet visor, grabbed a cup of coffee and the Harley atlas, sat out on the porch and stared at the waterfall across the road. I took a few deep breaths and thanked God for another day. I jotted some route numbers down on a yellow sticky sheet and stuck it into the see-through part of the little tank pouch. Piece of cake. As they would say in Ireland, I was on the pig’s back. What could go wrong? The sun had burnt the mist away and the sky was now azure and cloudless. I headed north on Highway 60, a mountain forest road filled with tight turns, switchbacks, gentle rolling hills, sweepers, and twisties. Big Red slalomed through the curves gracefully. There’s an art and joy to riding in the mountains. The pleasure of matching your speed and gear to the curve, smooth clutching, downshifting, picking your line, leaning into the curve, trusting that you’ll come out safely on the other side, and when you do then accelerating and upshifting. When you do it right you feel at one with the bike and with the countryside you’re riding through. I rode through the Chattahoochee National Forest, into Ellijay, across Fort Mountain, into Dalton and over into Alabama. After initially riding in the lush mountainside I now descended into rural areas with closed and decaying stores and passed old clapboard houses and shotgun cottages. Cars for sale were parked out by driveways and the frayed shopping centers were filled with gun shops, hairdressers, and title pawns. A scent of sadness and desperation hung in the air like a mist the sun couldn’t burn through. But beauty was also always there if you looked for it. I passed blooming magnolias with their creamy blossoms, gnarled live oaks with Resurrection Ferns and Spanish moss. There were tall sugar pines and mimosas with their silky pink blossoms. Purple wildflowers, daisies, and Mexican primroses graced some of the roads. You just had to be willing to see the beautiful and then look. What was that old saying? Some things need to be believed to be seen. A wave of thankfulness swept over me as I rode. As the afternoon wore on, clouds, some bruised, some gunmetal gray, started filling the sky. Hula girl was still dancing happily but the fuel warning light had come on for the third time that day. Time for another gas station stop. I was about two miles out of town when the rain began bucketing down and sideways at me. The temperature dropped dramatically and a chill shivered through me. I lowered my visor and kept riding. I was half soaked by the time I spotted a station, pulled in and parked under the canopy. I felt tired and a bit sullen. I took some clothes out of my bag and went in and changed. I looked in the mirror. My hair was stringy and almost down to my shoulders, wet from sweat and rain. I had about a three days growth on my beard. My buddy Joe used to say to me: When you were born you were so ugly your momma had to tie a pork chop around your neck to get the dogs to play with you. I laughed. If I saw myself on the street I’d be tempted to give myself a wide berth. I managed a smile and gave myself a talking to. Loving kindness Monk. Towards yourself first, then others. No matter how you look, no matter what you feel, that’s what you show. I went inside to the restaurant and ordered some hot coffee to help me thaw and dry out. There was a couple in the booth across the aisle from me. The man reached across the table to hold the woman’s hands but she pulled them back quickly, holding her palms toward him like a warning, and for some reason, I thought of a hurricane. The body language wasn’t looking good. He leaned his left ear in her direction. He sat upright. “Aw honey, that’s cold.” He cocked his head and put on his best sad face. She stood up and shook her head. “Goodbye Cletus.” She said and then walked away. His head bent down over his scrambled eggs, he mumbled a private threnody of loss and put his hands in his hair like he was going to pull it out. He grabbed his coat, slid out of the booth and stood up. A grin broke out over his face. “She needs me to drive her home.” I watched as he hurried out. It was dusk by the time I reached Memphis. The bumps and potholes of Highway 72 had bounced me around a fair bit and I’d hit a ton of traffic lights heading into the city so I was beat. I drove all the way up to the Mississippi River and parked the bike at Tom Lee Park. As soon as I climbed off I realized how tired I was. I had been in the transcendental state of riding and hadn’t noticed. I took some deep breaths and stretches and walked over to look at the river. My phone rang. “Great. Just made it to the Mississippi River a few minutes ago. I’m looking at it. It’s beautiful. How’s Bobbie Lee?” She was his Chinese wife and she taught physics at South East Georgia University. What was the name of that town in China she was from? “Hold on for a second Joe.” I took a deep breath and thought about things. How much should I tell him? If he knew I had a copy of the interview DVD it could put him in danger. Only Smitty and I know I have a copy and I’m damn sure he’s not going to say anything about it. Joe doesn’t need to know about the DVD but he does need to know what happened. They’ll think he does regardless of whether I tell him or not. I lifted up the phone. “Aw damn.” A silence ensued. We said goodbye and I leaned against Big Red and felt a zephyr of coolness blowing off the river. I felt relaxed and happy. I looked up at the sky, the indeterminable stars in our galaxy and wondered: Do we have a soul? If so, where does it come from and where does it go? I’ve always felt I had a soul, some connection with God; a conduit between the eternal and the finite, which contained all the holy lost and found parts of ourselves. Scanning the sky for a sign of a motel I noticed the Econolodge, the Super 8 and the Hudson. Which one? The guidelines for the road I came up with said that when I couldn’t decide on things I was to pick the choice which came alphabetically earlier. I pulled into the parking area for the Econolodge and got a room. I parked Big Red and then carried my gear across the long parking lot and to the elevator. I was sweating up a storm under the weight of all my stuff. The elevator door opened and a woman started to walk out, saw me, checked the floor number and stepped back inside. “You should check it out.” The elevator stopped and she walked out. I dumped my stuff in the room, took a shower, got a little map of the downtown area and walked the few blocks into the city center. I got lost a few times, normal enough, but finally made my way to Charley Vergos Rendezvous restaurant for ribs and brisket. Damn, they were good! Then I walked down to Beale Street to listen to the music and check out the bikes since it was biker night. Saw some magnificent old Indians, Harleys, and BMW’s. Then I went back to the motel and fell asleep. I’ve never really taken a trip like this before where I didn’t know exactly where I was going. I tell a lie, as they say in Ireland. I did do it once before, it was the first time I quit the police force. Back then, after the death of the social worker, nothing I tried would help me feel better; not counseling, not medication, not confession. I decided to leave Savannah and leave my destination up to fate. I packed my bag, went to the airport, up to the Delta desk and asked for a plane ticket to their furthest destination. I ended up in Ireland, where I met my first wife, who later died, and my second wife. Since then though on my travels, I’ve always liked to plan ahead, book a room somewhere, make a beeline for it and hightail it there. The problem with that method is that you don’t leave much room for chance, fate. Getting to the destination starts to take priority and influence all your decisions. You go past things that maybe you should have stopped for. Much of life is just going past things because we didn’t think they had any value, we weren’t looking anyway. But how can God, Fate, or the Universe reach us if we always try to control things? Sometimes the only way to find out where you need to go is to let yourself get lost. And trust that things will work out. That’s what I’m going to do: not plan things; get lost; trust the road and enjoy the ride. This trip is going to be different. Look upon everything with reverence. Check the bike each morning and see if everything’s tight and nothing’s leaking. Check the same on myself. Call or text the kids every evening to let them know where I am. Before I call, find out where I am. Never mention any dangerous incidents to the kids. The only past I want to look at is the one in my rear view mirror. Trust that the people I meet have something to give me or I have something to give them. To remember that I am a sovereign wayfarer. At every moment I have everything I need to be happy. I am a spiritual being in a physical body. But don’t let that physical body get hurt. Stop when I feel like it. Go when I feel like it. Bless them in my mind. If someone asks for help, help them. Don’t ride past anyone in need. Show lovingkindness to everyone I meet, unless they’re stealing my stuff. Always head away from bad weather, unless some omen tells me otherwise. Remember which way I went the last time. If I have to choose between two things and I can’t, choose the one that starts with the earliest letter in the alphabet. When it comes to sizes, if I don’t have any better reason, pick the smallest. Give money to every street musician I see. The important thing is not to think much, but to love much, and so do that which best stirs to love. I pass a biker and we flash the salute to each other. Ordinarily, it’s the left arm outstretched and down and the hand extended. It’s a way of saying “hello”, “ride safe” and on another level, “I honor your spirit”. Kinda like the Hindu greeting Namaste, but for bikers. Another biker passes me a few minutes later and starts patting the very top of his helmet. That means that a cop is up ahead somewhere. Sure enough, when I go around the curve there are blue lights flashing and two cars on the left side of the road. A police cruiser and an old 1970’s Delta 88 Oldsmobile with a white guy in it. The cop caught him heading towards Savannah and he’s writing out what I’d guess is one of those fast driving awards. I give a salute to the state trooper who’s busy talking to the lucky motorist. Then I hear a loud bang, a backfire, or gunshot and look in the mirror and see the trooper’s been shot. He’s down but returning fire. I slam on both brakes and the tires squeal, the rubber burns spewing grey-black smoke as I spin the bike around. I give it full throttle and the rear end swings into line and I scurry the bike up behind the police car, park it, reach in my saddlebag and pull out my Taurus and an extra clip of ammo. I run to his side. He’s been hit in the thigh. It’s a through and through. He nods. The man in the car is still firing. I don’t know why he hasn’t driven away. I pull off my leather jacket, take my shirt off and wrap it around his thigh to stop the bleeding. I wish to hell the guy would just drive off. But the way he’s heading is a one-way road to Savannah. The police would block it off and he’d be caught easily, which may be what he’s thinking. His only chance of escape is to turn around and pass us and get lost in the low country backroads. The driver’s door is flung open. He jumps out and runs around behind it. He fires. A shot hits the outside mirror of the police cruiser smashing it and shattering the glass. The cop starts to return fire, somehow not realizing he’s in the direct path of it now. I grab the back of his flak jacket and drag him around to the back of the car. He’s waving his gun erratically and fires an errant shot which cuts across the road to the opposite side and hits a palm tree. A chunk of the husk goes flying. The trooper’s safe behind the patrol car but he’s still losing blood. I take his gun from him and he doesn’t notice. I tighten up my shirt on him but there’s so much blood everywhere that I can’t tell if I’ve stopped it. His eyes are beginning to float. “They 10-4’d you didn’t they?” He can’t seem to understand. His face alternates from an eerie pleasant smile to an expression of surprise and sudden agony. I don’t hear any sirens. I pull up his communicator and relay the message to dispatch and our location. “10-4, we’re on the way.” The crackly response cuts through the air like verbal lightning. I want the perp to leave. I’ve seen enough killing in my life, done enough. I hate it. I peek over the trunk and shout: “He’s down. Leave!” The driver fires back. He’s flanked me, crossed across the road and is hiding behind that same palm tree. Maybe the officer was trying to hit him with his shot. I’m thinking of my options. I can shoot out a tire or into the gas tank but that would only make the driver stuck. I want him to think he has options, but of course, by now he has none. He’s shot an officer and even if he tries to surrender to them I fear he’ll just be shot in retaliation. I just want to keep the officer and me alive, and him. Now I can hear the Doppler wailing of sirens coming from both directions. I see his head spinning left and right as if imagining he really had anywhere to run. I put my gun next to the officer who’s looking more remote second by second, like a small oarless boat heading for some distant island. I stand, put my hands up and shout “Look, no gun.” I wave my hands and start to walk toward him. “Give me your gun and you can stand behind me. I’ll be your shield when they come. It’s your only chance.” He looks like he’s thinking about it. Maybe he’s on meth, but at the very least he’s on adrenaline and testosterone. I inch closer as the police cars start to appear and begin flanking the road. He nods and drops the gun by his side. I run up to him, take a pencil from my pocket, stick it in the barrel of his gun and hold it high. I stand in front of him and shout: “I’ve got his gun! There’s an officer down behind the car.” I look at the man behind me and mentally, I can see he’s somewhere else. He has a smug look on his face and he’s turning his head left and right and nodding like he’s waiting for a job interview he’s confident he’ll get. The cops are out of their cars behind their flung open doors. I spot a few police issue assault AR 15’s and shotguns. I watch as one trooper while holding his hat on, scrambles over to the downed officer and checks on him. He stands and shakes his head somberly. “He’s dead.” He shouts. I look at the man behind me. His head is turned away and moving slowly like he’s calculating sums that don’t add up, his eyes are unfocused, lost in the haunts of inwardness. A smile is trying to fight its way onto his face. He stutters, spit comes out of his mouth. “You do love me, Jesus.” He mutters. A shot rings out and I hit the ground. I turn and look at the man. He has a bullet hole in his forehead, is still nodding confidently, and then slowly crumbles to the ground. So much for trying to get out of town, to get some peace and quiet, away from the violence that has always dogged my life. My throat was tight, my eyes wet and my mind flashed through the wretched deaths I had witnessed over the years. Those last words the man had uttered. They kept tugging at some vague memory of mine. Then it came to me, the words from a Flannery O’Connor story: he would have been a good man if there had been somebody there to shoot him every minute of his life. I let out a deep sigh and shook my head. Wouldn’t we all? I was questioned for about two hours and the officers were not happy with my report. I testified that the man was not holding a gun, was, in fact, surrendering, when he was shot. My statement was recorded on camera before I was finally allowed to leave the station. On my way out I ran into an old friend. “Sure has.” He said shaking his head in an expression of marvel. I had a flashback of walking hunched over in a dark, dilapidated building, with debris all over the floor. There was the stench of ammonia and cat urine, a smell like a burnt shower curtain – all signs of a place where people were making and using meth. I saw sudden flashes of orange/white light and heard the sharp, deafening, cracking booms of a 38. Then there was a low voice saying “Monk, I’m dying.” I remember squatting, feeling scared to death, crying and then somehow managing to get over to Smitty, lifting him and throwing him over my shoulder. His blood was running all over me. I scrambled through the building with him and then felt the sharp sting of a slug being sucked into my right leg. I fell through the front door to the outside, dropped Smitty and hit the ground face first in the dirt. I nodded to Smitty. “I remember.” I could feel the tears damming up, ready to fall. His eyes scanned left and right and he let out a slow deep breath. “I can do that.” He nodded. I put my hand on his shoulder. “Thanks, Smitty. I’m in no hurry. I’ll be out front by my bike.” I started walking down the hall and passed officers who smiled and nodded as they went by. Then I saw one in the distance heading my way who was averting his eyes. He looked like one of the officers from the scene of the shooting who had been pointing an AR 15 at us. Without thinking he smiled and replied, “Thanks.” Then I saw the blood drain from the face of Officer Falcone. I smiled and walked out. Two hours later Smitty appeared carrying a small shopping bag. He scanned the place and didn’t see anyone watching. “Here”. He handed me the bag. I peeked inside and saw a DVD in a sealed case. It had an official evidence tag with a label on it, with my name, the date, and Smitty’s signature. I hopped back on the Road King, put my kickstand up and headed out. I tried to recover that peaceful Zen feeling that usually comes to me almost automatically as soon as I start to ride, but my heart wasn’t in it. Maeve, my first wife, always told me I was good under stress. Now, I felt sick to my stomach. I pulled over to the side of the road, threw up, put my head down on the motorcycle and started crying. Autumn is coming. Trees on the hills are gossiping about their changing colors. Despite having put 10, 000 miles on the bike this summer I can’t stop riding Big Red, my 2004 Harley Road King Classic. I enjoy it so much. We’ve been having a drought here in Georgia so every day’s been dry. And hot too. So hot that chickens have been laying boiled eggs; men have been proposing to tall women just for the shade. You get the idea. Yesterday, as I headed home from work the rain started falling. It wasn’t too bad at first but then it became heavier. At this point bikers usually look for an overpass they can park under to either wait it out or put on their rain gear. Or maybe they start looking for a gasoline/petrol station where they can hunker down for a while until it lets up. That’s what I did. I knew there was a station just a few miles down the road so I kept going. While riding there, rainbows started to almost crowd the sky. It was like they had been waiting for the damn drought to be over so they could show off their beautiful colors. Rainbows to me are always harbingers of hope, reminding me that we all can learn to be at home with insecurity. Leaving the gas station a drizzle continued and I watched the mist, rising off the hot asphalt and the fields near the road, and watched it kissing the low lying clouds. Romance is everywhere. Rode Big Red up to work to teach my class, and since it was International Talk Like a Pirate Day I dressed up. Hopefully, I can get a picture attached. I also rode it up to the free meal program I volunteer at and enjoyed the excitement of the little kids who climbed up on it and tried on my helmet. I don’t do much at that program other than read books, make paper airplanes, talk to folks and mop up. I can swing a mean mop. I offer my students extra credit if they’ll go to the program, not tell folks they’re students or what they’re doing, mingle a little, have a meal and write a paper about it. I usually only get a few students who’ll do it but they always find it a profound and humbling experience. It’s one thing to read about poverty and see it and another to feel what it’s like. No one wants to ask for help, or be seen receiving it. Big Red brought me over to the river the other day so I could walk on the tree lined path that accompanies it. It was hot and I got pretty sweaty. I had a Harley shirt on and some jeans but I must have looked a little rough when I stumbled into a barbecue joint to get some ice water. After sitting there munching on ice for a while a man walked up to me and said in a low, gentle voice: “Excuse me sir. My family and I are were talking and we wondered if we could buy you a meal?” I was surprised, smiled and told him thanks, that I was alright. What would you have said? They must have thought I was homeless. That’s fine with me. But heartfelt, courageous, random acts of kindness are so beautiful they fill me with hope, just like rainbows. Day 21: Leaving Bandon; 856 Miles to LA; Random Reflections; Zen; Gratitude. Day 21: Leaving Bandon; 856 Miles to LA; Random Reflections. The good thing for me is that these 865 miles are all on the same road – Hwy 101 in Oregon and 1, The Pacific Coast Highway in California. Staying on the same road significantly decreases my chances of getting lost! I like Sunday mornings. Especially rides on Sunday mornings. It’s often the church of choice that I visit. Not that I have anything against regular churches – I’ve attended many different kinds: Catholic, Episcopalian, Methodist, Baptist, Lutheran, Evangelical, Pentecostal, Anglican, ecumenical, etc and others that were non-Christian. My thought is that if they help make you a better person in the church and out of it, then more power to you. I always liked it that the Dalia Lama said something like: I don’t want you to become a Buddhist. I want you to take what anything you find useful from Buddhism to help you become a better whatever you are. That’s what I try to do. Anything that helps me become less judgmental and more compassionate I’m all for. Mother Theresa nailed it when she said that if you’re busy judging people you can’t be busy loving them. My church is the open road where you meet people that need help (sometimes just a smile) or ones that have a message for you. Buddha spent a lot of time on the road. Jesus also ran up a lot of miles. If he could have, I know Jesus would have ridden a Harley Road King, like Big Red. Buddha I see cruising around more on a Fat Boy. This morning’s ride was holy, full of grace and gratitude. I rode along the magnificent coast of Oregon and stared out at the Pacific, its roiling waves, whitecaps, and the huge determined stones that jut out from it. It reminded me a lot of the coast of Ireland, except in Ireland everything was greener and windier and wetter. I thought about Robert Pirsig’s line (which others had said in various forms before him) that the only Zen you find at the top of the mountain is the Zen that you brought with you. I agree to an extent. But certain places help bring out the Zen more in me. A peaceful, silent ride like this morning’s has me sinking into the present, letting go of the past and not worrying about the future. A deep sense of gratitude comes over me and I shout: Thank you God! Much like Kerouac did. Zen is a tool. It is not a religion, it’s a philosophy, a method to use to help reach a sense of completeness, peacefulness, love, compassion and gratitude. Whether you’re at the mountain top, riding along the coast or just washing dishes, it helps you see that at every moment you have everything that you need to be happy. You don’t need more, better, faster, prettier, thinner…you need awareness, self-acceptance and compassion (including compassion for yourself as you are). Rub these things together like sticks, and you get the sacred fire of gratitude. May you ride down whatever road you are on today with the fire of gratitude in your heart. This week has been a tough lesson in saying goodbye. First, my senior students graduated on Saturday and so I rode Big Red up to Dalton and donned the cap and gown and walked in the procession during their ceremony. I’ve known them for three years since they took my Introduction to Social Work course. I’m so proud of their accomplishments and yet so sad to see them go. All 20 have gotten job offers and over 75% have been accepted to graduate school. Then we had to pack our offices up. They’re remodeling. It reminded me of my last packing in Ireland, when I left there 4 years ago with just 4 suitcases, after having lived there for 16 years. That was a tough goodbye, but it taught me some profound lessons; letting go, trusting, risking, humility and compassion, to mention a few. Then it was saying “goodbye” here in town to the many kind friends I’ve made since I moved to Rome. I’ve been told they’re taking bets on how far I’ll make it. How many times I’ll stop at Harley shops along the way. It’s the usual ribbing, the taking the Mickie out of me, by friends, mates or “muckers”, that lets you know they care. Okay, well some of them. (You know who you are!) I know that I should be back in a few months’ time but motorcycle trips have a way of causing everyone to think about the rider’s mortality, especially the rider. Still, there’s nothing I’d rather be doing. All true adventures have an element of peril in them. I am excited and optimistic about the trip. I figure it’ll take me about 14 days to get to Alaska and I hope to keep posting everyday along the way. From Alaska I’ll head down the west coast and spend some days on the Pacific Coast Highway all the way to LA. But for tomorrow, I’m aiming to get to Paducah, Kentucky! … I don’t know exactly what a prayer is. What’s in it for me? Missing the Harley. Compassion. Yesterday I rode the bike for the first time in over two weeks. It felt great. Here in Georgia, it has been unseasonably warm as it has been in so many places. I ride my Harley all year ‘round, so if the weather is half decent, I’m out on Big Red. I rode a lot in December, back and forth from college, took roads I hadn’t been on in a while and visited that free meal program where I volunteer. These last two weeks I had been in LA (no, not Lower Alabama!) visiting my daughter, son in law and son for Christmas. My other son was stuck in poor old London. Cheap LA flights on no thrill airlines where the seats won’t even go back was too hard for me to resist. A five hour flight, but you know, if I’d had the time, I would have preferred the five day motorcycle ride. I had a great time in LA. Watching the new Star Wars movie in IMAX 3-D at Grauman’s Chinese Theatre, having a drink at Timmy Nolan’s pub, watching football with my kids at the Starlite Cantina, visiting a pirate themed bar, playing cards, a day trip out with my daughter to Venice beach, walking all over the place, and just being with family were some of my favorite things. Still, I was missing Big Red. I even Googled how much it would cost to rent one of those new Indian motorcycles while I was there. It seemed too wasteful to me so I passed on it, but of course the ad now follows me everywhere I go on the internet. I drank a lot of coffee, did a lot of writing on my new novel and walked every chance I could. It was a challenge for me walking the streets, because the only people who would make eye contact with me were homeless people. To native Georgians, a man is considered rude if he won’t smile and make eye contact with you. My daughter told me that so many people in LA, not just the homeless, want something from the people they meet, that folks are suspicious of random contacts. My daughter and I talked about how this was like the line in White Christmas where Bing Crosby says that everyone has a little larceny in their heart, that everyone has an angle they’re playing, a what’s in it mentality. This seemed to be true as I overheard a number of conversations (a writer’s obligation) at coffee shops where people were selling something, sometimes selling themselves (for a job), and negotiating deals. It took me bumping into someone in a grocery store or picking up something someone had dropped to start a real conversation. But then the ice was broken and folks were nice. What’s in it for me? Is that the motive behind a lot of our actions? I had been thinking about this a lot when I was working at the free meal program a few weeks ago. So what was I getting out of it? Then I accidentally (yeah, more like karma) stumbled upon a passage in a book that I was reading that sent the message right to my heart. From Nadia Bolz-Weber’s “Accidental Saints”. While we as people of God are certainly called to feed the hungry and clothe the naked, that whole, “we’re blessed to be a blessing thing” can still be kind of dangerous. It can be dangerous when we self-importantly place ourselves above the world, waiting to descend on those below so we can be the “blessing” they’ve been waiting for, like it or not. Plus, seeing myself as the blessing can pretty easily obscure the way in which I am actually part of the problem and can hide the ways in which I, too, am poor and needing care. Seeing myself or my church or my denomination as “the blessing” –like so many mission trips to help “those less fortunate than ourselves” can easily descend into a blend of benevolence and paternalism. We can start seeing the “poor” as supporting characters in a big story about how noble, selfless, and helpful we are. Wow. Don’t get me wrong, acts of kindness when and wherever they happen are great things. We’ve all got to keep them up! But I’ve got some thinking and reflecting to do. Which is okay because the spiritual journey lasts a lifetime (hey, if you’re into reincarnation you might even get a few lives out of it!). As with motorcycle journeys, spiritual discoveries and journeys are always waiting for us. We just have to open our eyes, trust and keep riding. Have a happy, compassionate and safe new year. 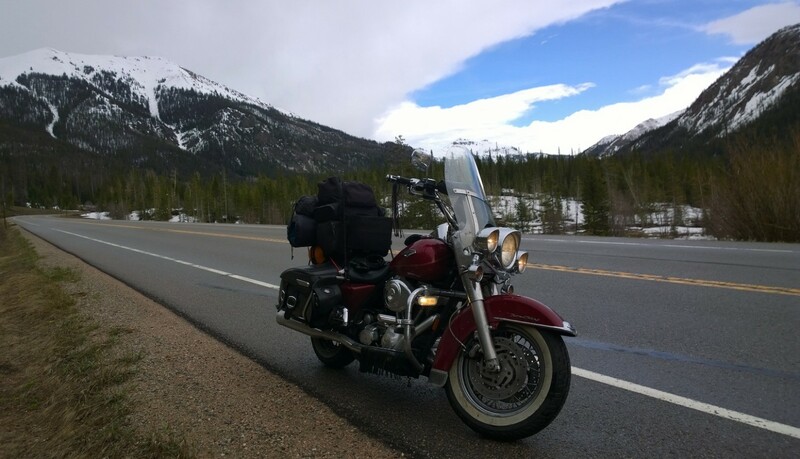 I managed to ride Big Red, the Harley Road King, four times this week. But I was so busy with work that I lost my concentration. I was supposed to be looking for angels, or Elijah or one of the Lamed Vav that I mentioned in my last post, but instead I was sunk into “everydayness,” (Alltäglichkeit” in Heidegger’s German –those Germans have a word for everything!). I was preoccupied with my daily routine. And I have to confess that I lost my Zen a few times, got angry at a few drivers who were being reckless around my motorcycle. I had a long day on Thursday, when I taught three classes –five and a half hours of class. I missed lunch. By the time I was finished I was knackered, as they say in Ireland. The last thing I was thinking about was angels. I was starving. Then I remembered that it was the night, once a week, that I visit a free meal program and try to help out. Sometimes it means helping serve people, just saying hello to folks, taking the trash out and mopping up. But lately I’ve found that I have another useful skill; though I am amazingly incompetent in most things involving my hands, I can make a great paper airplane (Thanks to the generous patience and tutelage from my cousin, Terrence Seyden). So to keep the kids occupied until the food was ready, a few weeks ago I started making planes. And when the kids asked me for a plane I told them I would give them one if they read me a book. Three weeks ago when I first launched this idea I made over twenty planes. For the youngest kids I’d make them one if they listened to me reading them a book. I quickly renewed my relationship with Dr. Seuss, and to this day, despite everything, I still do not like Green Eggs and Ham. And having attended many a morning breakfast on St Patrick’s Day in Savannah, Georgia, I can assure you that I have tried green eggs and ham, along with green grits and I did not like them, Sam I am. I had a few kids this time that read “okay,” struggled with a few words, but they got their planes. But then I had two small children who I had to read to. One, tiny cute Latino girl had me read her the story of the little train that could. Her younger brother (maybe 3 years old), and who only spoke Spanish, kept interfering with us by handing me books and rubber tigers and lions and other animals. Now, I was just sitting at one of the tables where everybody eats and I’m still starving, not having had any lunch. After the prayer, the kids always get their food first, which is as it should be. I’m so hungry I’m eyeing theirs covetously! One of the leaders is handing out stickers from a book. “Anyone not get a sticker?” she asks and I raise my hand but she doesn’t see me. The little boy across from me pouts along with me in sympathy and hands me a rubber bear. Eventually, the grownups get their food. It’s delicious! Hotdogs, chili, cole slaw and fried potatoes. One older boy is eyeing my potatoes and I’m squinting at his bowl of chili. We trade. Later, after the meal I’m asked to watch the kids playing outside while they wait for the van to bring them back home. Paper planes are flying everywhere, a few girls are doing somersaults, and others kids are playing tag (tig). The little boy, who earlier had been giving me the books and the animals comes up to me. He mumbles some words I can’t understand while he affixes his sticker onto my leather vest. It’s Mickey Mouse. “Gracias,” I reply and smile at him. He smiles back. I mumble the few Spanish words I know: “Como se llama?” – which is: “What is your name?” He smiles at me and says: “Angel”. I watch as he runs off to play. How much better our society would be if we simply asked ourselves those questions about what we say and do. It would close down many news broadcasts completely and send most of the politicians packing their bags. I’d make less mistakes, that’s for sure. We could also use Kant’s Categorical Imperative to guide us but that’s for another blog. When I finally settle into a gear I like to gather my thoughts, and believe me those rascals run everywhere. Past, present, future. The usual: Why in God’s name did I do that? What did she mean when she told me that? I wish to hell I’d said that to them! The French have a phrase for that last one – “Esprit de l’escalier (es-pree der less-kal-lay) — A witty remark that occurs to you too late, literally on the way down the stairs.” From “In Other Words: A Language Guide to the Most Intriguing Words Around the World” by Christopher J. Moore (Levenger Press, Walker and Co., New York, 2004).Let’s have a show of hands – we’ve all had those reflective thoughts! After giving up on trying to herd the cats of my thoughts I finally try to meditate, watch my breath, be aware of things around me, do my “Be here Now” thing. It helps give me a quiet frontier where I can cultivate awareness, pray for folks and give thanks. I’ve come to love the silences. The long silences of cross country trips have affected me off the bike as well. I no longer listen to music or the radio in my Jeep, or as background noise in my house. But hey, that’s just me. Still, unless you try hard it’s difficult to keep the silence going when you’re back into your demanding and sound crowded life. I made a list of other things I want to write about in this series of: How do you describe a motorcycle ride? I hope they sound okay to you. Let me know if you want me to comment on anything else. But I’ve got to hit the road now because, dang it, I just thought of something I really wish I’d said to her!